作者: The AsiaN Editor on 26 March , 2019. During the past few years, ancient city wall and ancient buildings were restored in Datong, north China’s Shanxi Province. After a quick lunch, Li Tieling, 69, rushes to a location to take part in the filming of a war-themed TV drama in his village of Beishanyun, Yushe county, North China’s Shanxi Province. At the entrance of this traditional and ancient village, uniformed figures in army caps hold a heated discussion with the director about their scenes and positions, as well as how to interact with the lead actors. These figures are not professional actors, but local villagers who normally make their living from farming. As one of the new industries emerging in local poverty alleviation process, the film crew has brought opportunities of higher incomes for farmers. Li Tieliang gets up early in the morning to bring his passion and enthusiasm to his performances and excitedly looked forward to getting himself into a big scene of a blockbuster. He discussed the details of the scenes with his wife over breakfast to prepare for the day’s work. “I’ve been acting for three days, and it’s not over yet. My wife and I can earn 100 yuan ($15) respectively for each workday from 8 am to 6 pm,” he told the China News Service. After only a few days of filming, some local families have earned thousands of yuan as extras. Li has participated in a number of film and television dramas as an extra, and sometimes he even brings his whole family along. His son, who left the village for work, also joins them when he comes back to visit. For the family, this is not just a chance to earn a little extra income, but also a chance to have fun together. Shanxi Province is considered “the museum of ancient Chinese architecture.” According to media, the province preserves more than 70 percent of old wooden-structure buildings constructed during or before the Yuan Dynasty (1271-1368). Beishanyun is an ancient village that dates back to the Ming (1368-1644) and Qing (1636-1912) dynasties. More than 30 courtyards built in the Ming and Qing style are still well preserved. The authentic setting, a draw for many film and television crews, has become the shooting base for an increasing number of films and TV shows, especially those set during the Republic of China era (1912-1949). Zhang Yuzhong, a director who is currently filming here, told chinanews.com that it is hard to find backgrounds like this. “It gave us a lot of surprises,” he said. Beishanyun is a typical farming village, with many young people leaving home for work and elderly people accounting for more than one-third of the 248 villagers. When the film crews arrive, the surrounding businesses are also boosted, including convenience shops, hotel, and farmhouses. Liu Peng, 33, who works outside all year round, was once a poverty-stricken member of the village. In October 2018, taking advantage of a poverty alleviation policy, he opened a farmhouse. It has now received nearly 3,000 tourists coming to visit this ancient village, which has become known because of the filming. He also hired local villagers and encouraged them to join the tourism industry to start their own businesses and pull themselves out of poverty. 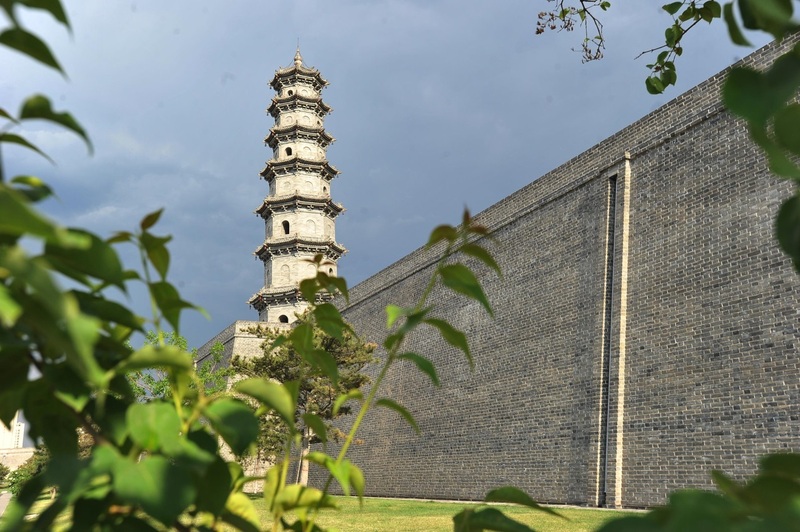 Since 2018, Beishanyun has been a model tourism poverty alleviation village in Shanxi Province as it develops tourism further by building a popular film studio. According to media reports, the village was lifted out of poverty in 2017. In the future, small-scale grain processing workshops, film and television bases, clothing workshops and rural tourism cooperatives will be established. “In addition to film and television base, we have also proposed to develop an ancient village tour to recreate the disappearing farming culture and lifestyle, such as ploughing and sowing, so as to attract research, study and tourism teams to experience the non-mechanized farming life,” Li Xiaoli, the first secretary who was dispatched to the village by Shanxi Red Cross Society, told the China News Service. There are rich intangible cultural heritage here, such as yangko (a popular rural folk dance), weaving arts, dough figurines and so on, she added. In the future, the village aims to build inns that will allow tourists to live in greater comfort, also attracting more capital to further develop Beishanyun’s tourism and drive up every family’s income, according to Li Zhigang, Beishanyun’s village secretary. Tourism is a new and powerful means of achieving poverty alleviation. According to statistics released by the National Tourism Administration and other departments, it is expected that the development of tourism will lift about 12 million people out of poverty by 2020.